Are McLaren & Mercedes about to wind back the clock?.. Paddock whispers are a wonderful thing and it only takes someone to sit with the wrong person at lunch for everyone to jump to a conclusion. But, in this case there probably isn't smoke without fire, as it seems McLaren are seriously assessing their options for 2018. Don't get me wrong the situation with Honda is dire, Alonso’s retirement at the end of the Canadian GP that would have seen the team score their first points of the season may end up being the final nail in the coffin. However, there are numerous moving parts in making a switch to Mercedes powerunits for 2018, as now seems to be the want of Mansour Ojjeh at least. Firstly, what of the relationship with Honda? Is it recoverable? do they promise a switchback for 2019, seeing as the manufacturer is now locked into a deal with Sauber for next season - allowing a continued development cycle. Again, this appears to be a route that might be favored by all parties as McLaren and Honda look to save face and appease their two time world champion - Fernando Alonso. So, what causes these issues? Fuel - McLaren ran ExxonMobil fuel and lubricants up until this season, a partnership that has spanned several decades and likely caused them a fair share of headaches in 2014 given the special relationship that Mercedes and Petronas had and continue to share. McLaren have switched to Castrol/BP this season as the petroleum giant re-entered the sport with the Woking based squad, whilst supplying their fuel and lubricants to Renault too. It’s probably fair to say that Honda can appease the obligations in this deal by simply switching it out with Saubers requirement, leaving McLaren picking up the fuel tab with Mercedes / Petronas - the former often brokering the deal, as we found out when Manor were dissolved. Boxing clever - McLaren have built their own gearboxes for years and will likely continue to do so but if they’re to make a smooth transition from one powerunit to another, especially if it’s only for one season, they might be better to seek the Mercedes solution that Force India also take as part of their supply package. Infact having joined the Grove based squad, Paddy Lowe has reportedly greenlit a carbon fibre constructed gearbox as the team look to make mid-late season gains from increased structural rigidity and a resultant weight saving. Counting the cost - Perhaps the largest hurdle that is faced in achieving this one season stop-gap is funding it. Alonso’s contract expires at the end of this season and Honda currently contribute a significant portion of the team's budget, including the Spaniard’s wages. Would Honda be prepared to make the bold step of continuing this funding in a transitional year though? Especially if success returns to Woking it would be Mercedes that would pick up the plaudits within the media and potentially lead to a full-blown divorce, irrespective of any improvements that Honda may be able to make next season with Sauber. Time - Making such a change requires planning, something that'll require a huge amount of effort and likely compromise their development cycle toward the end of the season. Honda improvement - joining the hybrid era around three years behind the curve was always going to be a huge challenge for the Japanese marque, but even so they’ve often seemed to be off kilter with the development mindset of others, initially refusing outside assistance and then an almost singular focus in the tools used to develop these hugely complex energy machines. I’ve said it numerous times since (one such time in 2015: http://www.somersf1.co.uk/2015/09/mclaren-hondas-woes-progression-and.html) their re-entry but they must look at the tools being used by the other top teams, of which an AVL style chassis dynamomter must be at the top of their shopping list - something I understand is underway and can’t come soon enough as we’ve recently heard that they have correlation issues too. 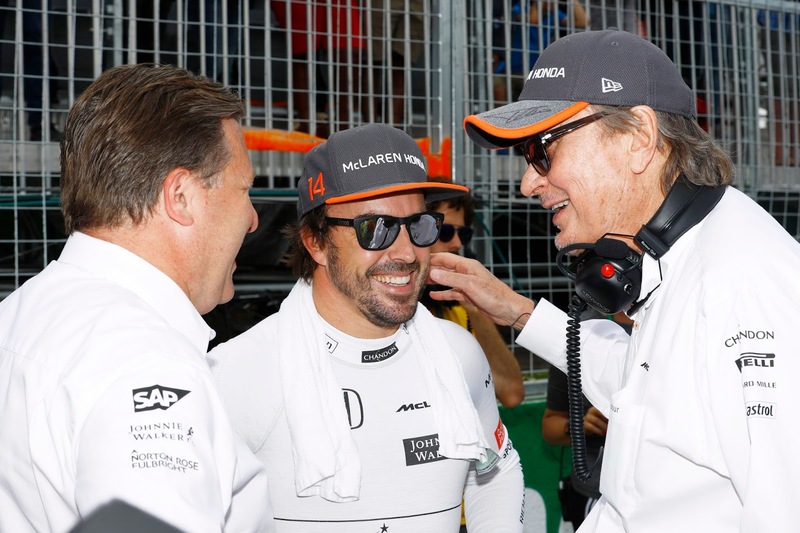 Whatever happens in 2018 the situation at McLaren is and has had a major impact on sponsorship retention and activation - something Zak Brown will be eager to remedy. Their Indy 500 adventure is further proof of this with their sponsors able to enjoy exposure for no extra cost - an olive branch extended to them for the poor performance of the F1 team and a shrewd move by Brown. The biggest issue of this supposed alliance of convenience (McLaren, Honda and Mercedes) is that the date for which you must notify the FIA of your intention to supply a team has passed. Appendix 9 suggests that the FIA must be notified by 6th May in the preceding year or an agreement must be reached by the remaining powerunit manufacturers. I can certainly see an objection coming from Ferrari or Renault, especially if they have any inclination that this will help to elevate McLaren beyond them. If you're in need of something to listen to on your commute into work then give my show on Missed Apex a try - here's the latest one. I think you're wrong re the 6 May deadline - my reading of App 9 paragraph a) suggests that the 6 may deadline relates to the entry of a new first-time supplier - if it applied to existing suppliers or existing teams, why would paragraphs a)ii) and a)iii) be necessary?